A star system 94 light-years away is in the spotlight as a possible candidate for intelligent inhabitants, thanks to the discovery of a radio signal by a group of Russian astronomers. HD 164595, a solar system a few billion years older than the Sun but centered on a star of comparable size and brightness, is the purported source of a signal found with the RATAN-600 radio telescope in Zelenchukskaya, at the northern foot of the Caucasus Mountains. This system is known to have one planet, a Neptune-sized world in such a very tight orbit, making it unattractive for life. However, there could be other planets in this system that are still undiscovered. 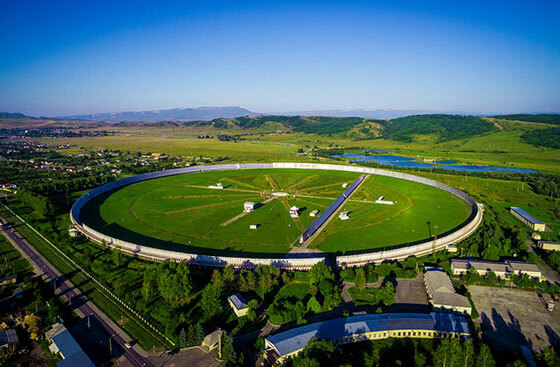 The signal seems to have been discussed in a presentation given by several Russian astronomers as well as Italian researcher, Claudio Maccone, the chair of the International Academy of Astronautics Permanent SETI Committee. Maccone has recently sent an email to SETI scientists in which he describes this presentation, including the signal ascribed to star system HD 164595. Could it be a transmission from a technically proficient society? At this point, we can only consider what is known so far. This is a technical story, of course. First, is the detected signal really coming from the direction of HD 164595? The RATAN-600 is of an unusual design (a ring on the ground of diameter 577 meters), and has an unusual “beam shape” (the patch of sky to which it is sensitive). At the wavelength of the reported signal, 2.7 cm – which is equivalent to a frequency of 11 GHz – the beam is about 20 arcsec by 2 arcmin. In other words, it’s a patch that’s highly elongated in the north-south direction. The patch from which the signal seems to be coming agrees in the east-west direction (the narrow part of the beam) with HD 165695’s sky coordinates, so that’s the basis of the assumption by the discoverers that this is likely to be coming from that star system. But of course, that’s not necessarily the case. Second is the question of the characteristics of the signal itself. The observations were made with a receiver having a bandwidth of 1 GHz. That’s a billion times wider than the bandwidths traditionally used for SETI, and is 200 times wider than a television signal. The strength of the signal was 0.75 Janskys, or in common parlance, “weak.” But was it weak only because of the distance of HD 164595? Perhaps it was weak because of “dilution” of the signal by the very wide bandwidth of the Russian receiver? Just as a pot pie, incorporating lots of ingredients, can make guessing the individual foodstuffs more difficult, a wide-bandwidth receiver can dilute the strength of relatively strong narrow-band signals. (1) They decide to broadcast in all directions. Then the required power is 1020 watts, or 100 billion billion watts. That’s hundreds of times more energy than all the sunlight falling on Earth, and would obviously require power sources far beyond any we have. (2) They aim their transmission at us. This will reduce the power requirement, but even if they are using an antenna the size of the 1000-foot Arecibo instrument, they would still need to wield more than a trillion watts, which is comparable to the total energy consumption of all humankind. Both scenarios require an effort far, far beyond what we ourselves could do, and it’s hard to understand why anyone would want to target our solar system with a strong signal. This star system is so far away they won’t have yet picked up any TV or radar that would tell them that we’re here. The chance that this is truly a signal from extraterrestrials is not terribly promising, and the discoverers themselves apparently doubt that they’ve found ET. Nonetheless, one should check out all reasonable possibilities, given the importance of the subject. Consequently, the Allen Telescope Array (ATA) was swung in the direction of HD 164595 beginning on the evening of August 28. According to our scientists Jon Richards and Gerry Harp, it has so far not found any signal anywhere in the very large patch of sky covered by the ATA. However, we have not yet covered the full range of frequencies in which the signal could be located, if it’s of far narrower bandwidth than the Russian 1 GHz receiver. We intend to completely cover this big swath of the radio dial in the next day or two. A detection, of course, would immediately spur the SETI and radio astronomy communities to do more follow-up observations. We will continue to monitor this star system with the Array. One particularly noteworthy thing about this discovery is the fact that the signal was apparently observed in May, 2015 (it seems that this was the only time in 39 tries that they saw this signal). The discoverers didn’t alert the SETI community to this find until now, which is not as expected. According to both practice and protocol, if a signal seems to be of deliberate and extraterrestrial origin, one of the first things to do is to get others to attempt confirming observations. That was not done in this case. I’d be surprised if it was aliens. Cool if it was – but the natural universe is stranger than we imagine. Possibly stranger than we can imagine.